Although it is on a small island, Put-in-Bay is Lake Erie’s largest resort destination with many attractions. Once primarily a day trip mecca, Putinbay has now grown to include a huge variety of activities and tours with guests staying a week or more in our luxurious hotels & resorts and vacation home rentals. Along with excellent prices, Put-in-Bay also offers their exclusive Bay Bucks Fun Discount Coupons which provides discounts on activities and tours around the island. The discount coupons feature savings of over $400 on restaurants and shopping around the island. Of course, despite all the new attractions, the # 1 draw to Put-in-Bay is still its historic Perry’s Monument and International Peace Memorial. So many things to do in Put-in-Bay, Ohio… still haven’t found what you’re looking for? Try something different – relax with a massage or learn some adventurous Lake Erie watersports. Put-in-Bay attractions, tours and activities. There is something here on Put in Bay for people of all ages. A 352 foot (107 m) monument – the world’s most massive Doric column – was constructed in Put-in-Bay, Ohio by a multi-state commission from 1912 to 1915 “to inculcate the lessons of international peace by arbitration and disarmament.” Beneath the stone floor of the monument lie the remains of three American officers and three British officers. It is among the tallest monuments in the United States (the Gateway Arch, San Jacinto Monument, and the Washington Monument are taller). Although substantially completed in 1915, funding problems prevented the proper completion of a fully realized memorial complex. In 1919 the federal government assumed control of the monument and provided additional funding. The official dedication was celebrated on July 31, 1931. In 2002, 2.4 million dollars was spent on a new visitor center. The memorial is visited by 200,000 people each year. Perry’s Cave, located 50 feet below Put in Bay, is open to island visitors for 20-minute tours. South Bass Island’s secret limestone cave is 208 feet long and 165 feet wide and has its own freshwater lake underneath Lake Erie. We suggest bringing a sweatshirt and comfortable walking shoes, as the temperature underground drops to about 50 degrees. Created in 1895 and located on the 6.5-acre Gibraltar Island at Put in Bay, Frantz Theodore Stone Laboratory is Ohio’s Lake Erie laboratory. It is the nation’s oldest freshwater biological field station and the Island Campus of The Ohio State University. The Laboratory offers college-level courses each summer with faculty and students coming from all over the country. Since 1990, students from 40 Ohio colleges, 27 out-of-state colleges, and 257 high schools have taken these courses for college credit. The Laboratory also provides a facility for year-round research, offers special conference facilities and speakers, and develops and offers custom-designed Aquatic Workshop programs for grades 4 through adult with over 5,000 participants annually. 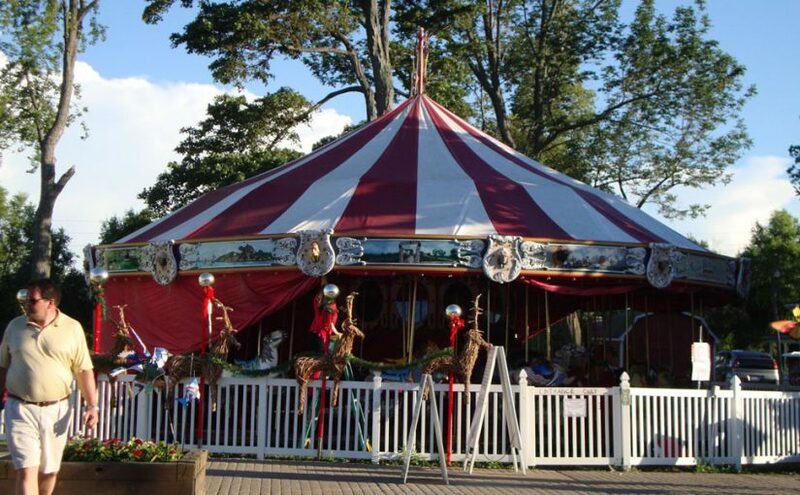 For only $1.50, you can take a ride on Put-in-Bay’s original 1917 Herschel carousel, one of the last merry-go-rounds in the country that’s still up and running. Kids love riding the cow, chicken, rooster, horse and pig, but any islander will tell you that Put-in-Bay’s favorite animal on the carousel is Pete the Perch. You can buy tickets next door at the Carriage House.